4. To the borrower, the obligation is to make the regular interest payments which requires cash on hand, and to pay back the principle when the term expires. So long as the company meets the debt requirements, it has no other obligations to lenders. 8. To the company, equity represents sharing the ownership with outsider investors. These part-owners get a say, through annual shareholder meetings and occasional votes, in how the company is run. While going public can increase the amount of capital the original owners of a company have access to, they must (potentially) share any profits with those shareholders. But the company has no obligation to return the capital investors provide through issuing stock. 9. To shareholders, owning a share in a company exposes them to the both the potential to share in profits, and the chance of sharing in losses. In return for this exposure, shareholders get to vote at annual meetings and on occasional issues facing the management. Shareholders may also receive dividends, which is one form in which the company returns profits to the owners. Not all companies pay dividends. 10. Companies can also choose to buy back shares, which effectively returns value to shareholders who choose to tender their shares for repurchase. Check out the Sept 22, 2014 entry on Damodaran’s Blog about buybacks – it’s great! If a company (public or private) has two basic sources of capital, how should they use these sources efficiently? Debt is generally less costly than equity, mainly because it’s less risky. A company must promise investors higher dividends or higher capital gains in order to entice them to buy shares. In the diagram below, the cost of equity is shown higher than the cost of debt. At the extreme left, there is no debt and the company is 100% equity. At the extreme right it’s all debt and no equity. The cost of debt rises as the share of financing from debt rises as lenders worry about the ability of the company to pay the interest on a regular basis. The blue line, known as the weighted average cost of capital (WACC, or ACC in the diagram), is the effective cost of acquiring assets, and it dips just right of the middle. The exact shape and position depends on many company specific factors, but one conclusion is clear: a company should fund assets using a combination of debt and equity, usually with a little more debt than equity. 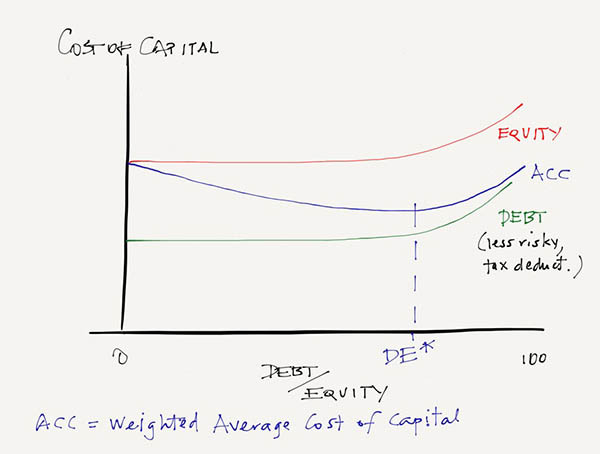 In the diagram, the optimal Debt/Equity split is shown as DE*. The debt-equity ratio (DE*) of the company in the diagram above is about 1.5, which is pretty much the average for US companies. But D/Es vary quite considerably. This Investopedia entry talks about the variation in these ratios across industries. ~Equity does not have to be paid back. There’s an expectation it will be, but no legal obligation to do so. ~Debt is a finite obligation. Once paid back, there’s no more burden on the company. ~Debt is cheaper due to lower risk. ~Debt servicing is tax deductible. ~Equity holders (shareholders) can vote on issues affecting the management of the company, and may want things that the management does not. ~If shares are sold to the public, the company must file reports with the SEC. ~Debt holders must be paid off before many other creditors if the company goes bankrupt or is liquidated. ~Interest on debt must be paid on a regular basis, and the principle paid back when due. A major problem for companies is to find the balance between these many, sometimes competing, factors. There are number of alternative theories to explain the balance between debt and equity financing of capital. Sometimes the debt-equity ratio is called the leverage ratio. (Check out this Investopedia video on the Leverage Ratio.) The cost of obtaining loans increases as companies go further in debt. To lenders the existing equity is being increasingly leveraged, and becomes more at risk. At some point the increasing debt service costs, and the inability to find anyone who will lend money to them, will mean that a company almost never is 100% debt financed. 2. Investopedia video on the Leverage Ratio. The Miller and Modigliani Theorem (1958) states that under certain conditions, the capital structure a company chooses–the DE ratio–has no effect on the value of the company. (See this LINK.) Miller won the Nobel prize in Economics in part for this “irrelevance theorem.” What is the importance of the theorem today? 1. When would you want to be a holder of a company’s debt (bondholder) and when would you want to be a part owner (shareholder?) Since debt and equity are traded in markets, both investors (demand) and companies (supply) have an influence on the relative price of debt and equity, and consequently on how companies are financed. 2. Apple has been involved in one of the biggest share buyback programs in history (Read more here.) What does this mean for shareholders of Apple? Apple borrowed money to buy back shares rather than use any of the billions in cash it had–why? 3. While “going public” with an IPO is a big deal (Facebook, Twitter,…) some big public companies go private (Chrysler). Why would a public company choose to go private?